Now calm down, we are not getting deep into classical physics 101 but you need to know the basics of second law of thermodynamics which clearly doesn’t state that “You do not talk about thermodynamics” (hope you get the reference). This may sound difficult but simply stated it means that Heat will never flow spontaneously from a cold object to a hot object. Here “spontaneously” means that there is no external cause, for e.g. in the case of refrigerator the heat actually flows from cold object to hot object but this is not spontaneous since the refrigerator is using an external source of energy, the electricity! 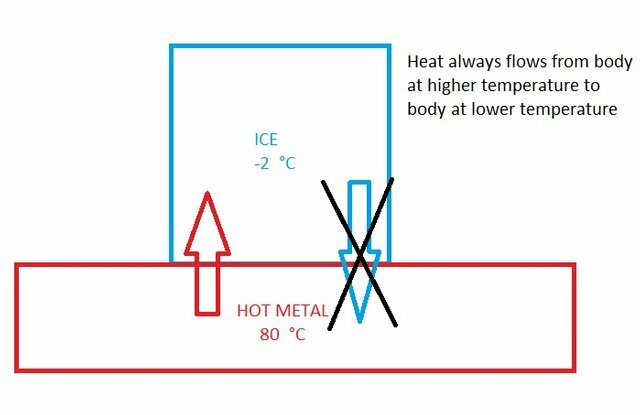 Consider an ice cube at -2 °C in contact with a hot metal at 80 °C. The ice cube melts because heat always flows the hot metal plate to cold ice cube. You don’t see a scenario where the ice cube gets colder unless you are from another universe governed by a different law of physics. Now you may be like duh! Do we really need a law to tell this? Well actually we need because if you think about it what stops the heat flow from the cold ice cube to the hot metal plate? Even if the heat flowed from the cold object to hot object, the energy is still conserved. The only known law of nature in this universe that prevents heat flow from cold object to hot object is the second law of thermodynamics! Enough with thermodynamics, let's shake some balls! Imagine a hypothetical box with two compartments separated by a wall. The left compartment has 4 blue balls and right one has 4 red balls. Now shake that box. 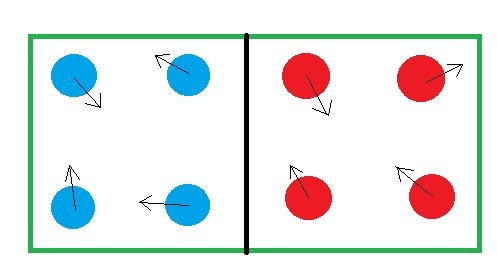 The balls will randomly move in different direction but never will a ball cross the wall to get into another compartment. So this system has a certain amount of order since the reds are separated from the blues. Now remove that wall and mix them! What’s gonna happen? Clearly, the balls will get mixed up. At any instant you might see a configuration like one in the picture above. As you shake, the system results in different configuration. This state is said to have a higher amount of disorderness than the previous state where we had the compartment wall. Theoretically, YES ,the probability of finding the balls lined up in their respective compartment is NOT zero. It will be a small number for sure but still not zero. But imagine this, instead of 4 reds and 4 blues there are 100 reds and 250 blues or 1,000,000 reds and 1,000,000,000 blues. In the midst of all these balls ,the odds of getting back to the ordered state are basically zero, still NOT exactly equal to zero but so close to zero that you may never see the ordered state. All the thing i said seems pretty obvious from out intuition and day-to-day life. You may still be wondering how come we never see a disordered state go to an ordered state. It has to do with counting. I will try to be as simple as possible . If you were to count the possibility of lining all the reds on the right side and blues on the left side, there would be lot of combination to satisfy the condition. Now I want to ask yourself how many possibilities are there for having the blues and red spread out through the whole box? This possibility will be lot more than having blues on left and reds on right. This means that the number of possible disorder state is very very larger than the possible number of ordered state. It is statistically improbable for a disorder state to go back to an order state spontaneously. Hope you are catching up to this point . ;) Now the realm of Entropy! 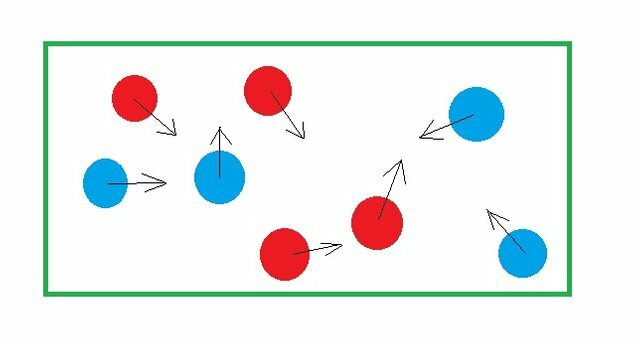 In the above thought experiment, the red balls and blue balls were analogy of quantum of energy in a molecule and movement of balls from one compartment to another is an analogy of heat transfer. Let’s get back to our original Ice-metal experiment. You many know this from high school level physics that the energy in a molecule is stored in the bonds joining the atoms and higher the temperature of the solid, the more energy it stores. This means that the ice cube will have less Quanta of energy in its bond than the hot metal. This may be better understood by the picture below. The Figure is a Schematic picture of Ice and Metal molecule. They don't look like this in reality! The ice cube is at lower temperature, it must have low amount of energy, this is shown by 2 Quanta of energy in the ice cube. The higher temperature of hot metal is shown by the 6 Quanta of energy. Since the energy are changing there position all the time, there will be various state .Each of this state is known as Microstate . So the picture of the ice cube configuration shown above is a microstate but when your look at the molecule at another moment, the configuration may be different, hence another microstate. Simple mathematics of counting shows that the total microstate of 2 Quanta of energy in the ice cube and 6 Quanta of energy in hot plate is 9702. That’s a pretty large number. Now let’s bring the ice cube in contact with the hot metal. Now the quanta of energy in ice cube can move to the hot metal plate and also the quanta of energy can move from hot metal to ice cube. The picture above shows a state where all 8 quanta of energy is in the ice cube and none in metal plate. Another state may be where half is in ice cube and half in the hot metal. All together there are 9 possible states which is shown in the table with the probability of each possible state. I hope you are not getting bored by all the mathematics, let's interpret the result! The first thing we notice is the giant bar on the 4-4 State with probability of 21%. WHY? because of the number of occurrence for this state is highest! The probability is highest in precisely in the position where there is thermal equilibrium between the two objects. This means the system attends thermal equilibrium just because its probability is highest,not some mysterious force! Now we can define entropy, it is actually the probability of each energy configuration. So the highest entropy is in the 4-4 configuration since it has the highest probability (21%). so in a general sense entropy can be thought of as a measure of energy spread, the 0-8 configuration has a probability of 2%, its entropy is lowest since energy is concentrated at the ice hot metal only. So when people say entropy always increase, it means that the energy always tends to spread out, this is just because the probability of the energy spread out state is the highest. You may ask one thing, the configuration 0-8 (all energy on hot plate) has a probability of 2%. This is quite a large number; this means we may see in real life that all energy of ice cube goes back to the hot metal but has anyone ever witnessed it? NO. The example presented above is a very simplified version of what really happens out there. It’s all about the size of the system. Our simplified system only has a total of 8 atoms, but in reality there are millions of atoms and bonds. If we reapply our aforementioned principle, the probability of energy going from ice cube to hot metal is nearly zero. NOT exactly zero but it may look like this: 0.00000000000000000001 %. This is so absurdly small that it never happens. 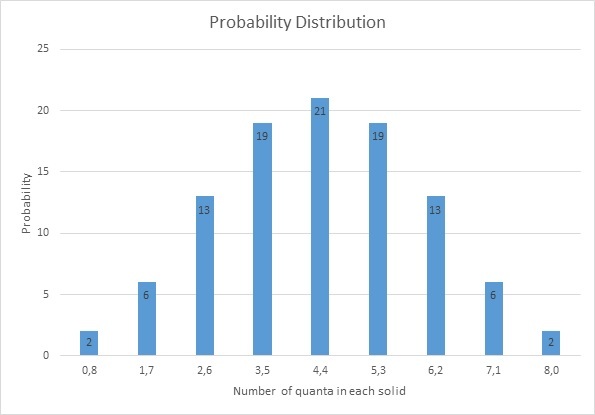 The probability of having equally distributed energy in a system is highest. So, Energy always has tendency to spread out and since entropy is the measure of the disorderness of energy, entropy always tends to increase. This is quite an interesting idea presented by Arthur Stanley Eddington in his book The Nature of the Physical World (1927). In his book he linked the direction of increasing entropy to the direction of time. This is commonly known as the “Thermodynamic arrow of time”. The idea of time is quite an abstract one. We, humans on Earth, are used to measure time on the basis of Sun’s position with respect to the Earth but on a grand cosmological scale what really defines the time? This may result in a great deal of philosophical and scientific debates. There are other various proposed arrows of time but here we will only talk about the thermodynamic arrow. Since we now know that the entropy of the universe is constantly increasing since the big bang, this results in the disorderness of universe. This process of increasing entropy has given birth to the stars, formation of galaxy and finally the chemical reaction that gave rise to life itself but it also brings death and decay but what if it was not the case? 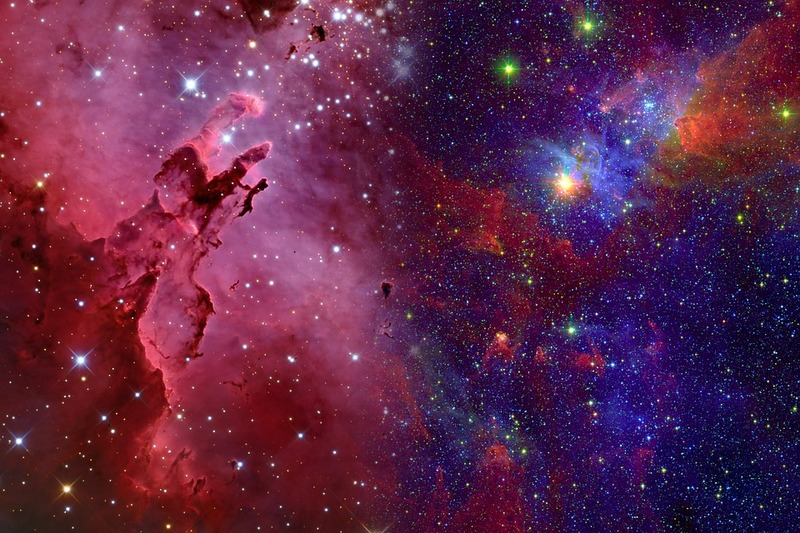 Then the universe as we know would not exist. Without the time’s arrow there could be no stars and no life. The interesting concept of second law helps us to distinguish between past, present and future on the basis of disorderness in the universe. In cosmological scale, entropy can be considered a clock. As the limited amount of energy continues to disperse, it is predicted that universe will eventually reach a thermodynamic equilibrium, a perfect distribution of energy. No fuel to burn the stars, no stars to support life. All gone. Hope you learned something knew from this post. Cheers! Çengel, Y. A., & Boles, M. A. Thermodynamics: an engineering approach. New York, NY: McGraw-Hill Education. Ben-Naim, A. Y. Statistical thermodynamics for chemists and biochemists. Place of publication not identified: Springer. No Copyrights were Violated. Free Images labelled for commercial and non-commercial purpose were used. The images without the source are made by myself on MS-Paint. 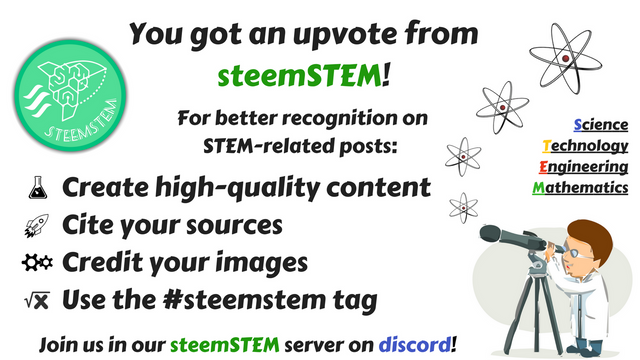 steemSTEM is a community driven project which seeks to promote well-written and informative Science, Technology, Engineering and Mathematics posts on Steemit. The project involves curating STEM-related posts through upvoting, resteeming, offering constructive feedback, supporting scientific contests, and other related activities. You should get an award for simplicity and elaboration. Even as a science student, I didn't bother to get more insight to the definition. I ll always describe it a "disorder" until now. thanks! I see you are a fellow mechanical engineer too. Yes buddy.... Are you from Nepal too?